Pre-heat grill at a medium temperature. Place potatoes in a pot of boiling water - simmer until tender approximately 15-20 minutes. In a pot combine crushed garlic and butter and stir well. Steam broccoli until tender for 8 minutes approx. Place steaks under grill and cook for 5 to 7 minutes for medium cooked, or approximately 8 to 10 minutes for medium-well cooked. Turn the steaks half way through. 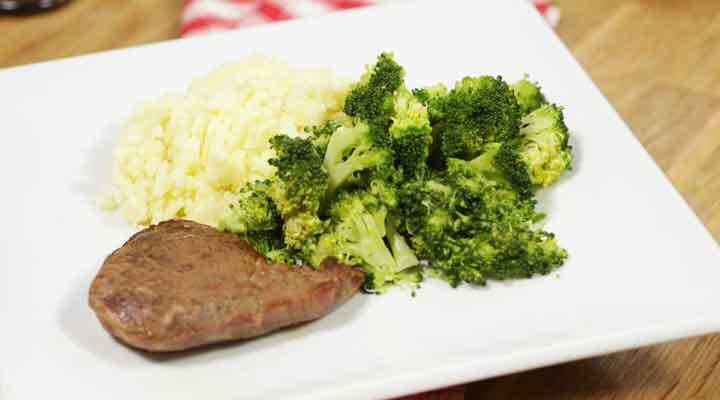 Take the two steak fillets out from under the grill and serve with the mashed potatoes.